Metal Gear Solid was first released for the Sony PlayStation in September 1998 (in Japan, anyway - the game would make its way to the US and EU by October 1998 and February 1999, respectively). 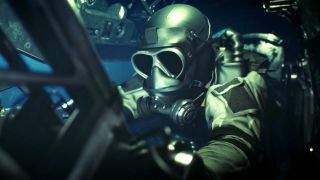 But with series creator Hideo Kojima now independent and publisher Konami currently quiet on the future of the franchise, it falls to fans to celebrate 20 years of tactical espionage action in style. The sequence is a mix of marketplace assets plus custom creations and flourishes by Brosdau (like that fun wink by putting "Model No. K0-J1M-A" on the front of the SDV that Snake rides into the base), but visuals weren't the only improvement. Brosdau also remastered the audio, which is why Colonel Campbell and Snake's voices may not sound as rough as you remember. If you'd like to see more from Brosdau, his YouTube channel, Warpgazer, features his past work as well as his original sci-fi project, Origin Zero. This isn't the only Metal Gear Solid project currently underway - Kong: Skull Island director Jordan Vogt-Roberts is still pushing forward with his vision of a live-action MGS movie, and says if he gets his way, it'll be every bit as weird as Kojima's games.